JUNEAU — A new playlist with instrumentals from Wu-Tang Clan and Pink Floyd has won a fan base among Alaska lawmakers, lobbyists and staffers stuck watching the Legislature's public-access channel during the sometimes interminable breaks from debate. The music comes courtesy of "Gavel Alaska," the public television program that streams House and Senate floor debates and committee hearings. The Legislature cuts off the station's audio feed when lawmakers bang the gavel for an "at-ease," prompting producers to turn up the music. 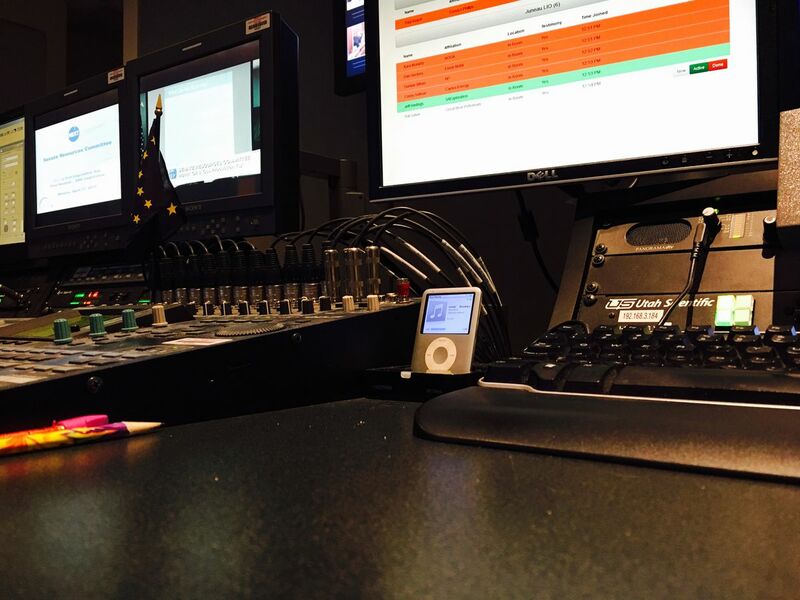 The songs are housed in an iPod that plays on a continuous loop from the control room at KTOO, Juneau's public broadcasting affiliate. And the music actually has a functional purpose, because without any sound, the provider of "Gavel's" satellite feed thinks there's a problem and calls the station. The iPod is "basically just on autopilot," said Jeremy Hsieh, KTOO's news director. Nonetheless, this year's new mix of music has produced some happy coincidences, such as when Wu-Tang's "C.R.E.A.M." — short for "Cash Rules Everything Around Me" — played during a break from the House's debate on the operating budget last month. And the House's recent vote on an income tax came after listeners heard Tears for Fears' "Everybody Wants to Rule the World." The tracks are all instrumental versions, but the sometimes poetic combinations of song and legislative subject matter aren't lost on viewers. "When you're stuck here, it's those little things that bring you joy," said Alliana Salanguit, 20, a first-year staffer for Fairbanks Democratic Rep. David Guttenberg, whose office plays "Gavel" constantly. The music, she added, is "a little ray of sunshine." Past playlists have consisted mostly of blander fare — especially after a 2010 incident in which the theme song from the movie "Titanic" was piped in at an inauspicious time, then written up in the Anchorage Daily News' political gossip column. This year's playlist was initially culled from the eclectic digital library of "Gavel's" new producer, Daniel Kirby, 30, then augmented with recommendations from the program's fans. It's now reached 150 tunes, includes the theme from Super Mario Bros. 2, raps from Jay-Z, Tupac and Missy Elliott, and a big batch of songs from Odesza, the electronic dance duo. Enthusiasm for the music seems to be loosely correlated with age. "I think it can be soothing, but at times, I think, interesting choices — not exactly something I would prefer to listen to quite a lot," said Sutton Republican Rep. George Rauscher, 59. "I'm not sure what age group it is actually intended for." But it's not just millennials relishing the new mix. Lobbyist John Bitney, 52 — a guitarist who performed earlier this year at the governor's mansion — tweeted his own appreciation Monday, saying "Gavel" "has really stepped up the tunes" for the legislative session. "The rave is seeking messages in songs," he wrote. Bethel Democratic Rep. Zach Fansler said he thought the music had improved from past years. But he said he'd like to hear more "traditional" songs — recommending Native performers like the group Pamyua or the Yup'ik singer Byron Nicholai. "Anything from my region would be great," he said. "We'd take whoever." Email your own suggestions to gavel@ktoo.org. View the full playlist.